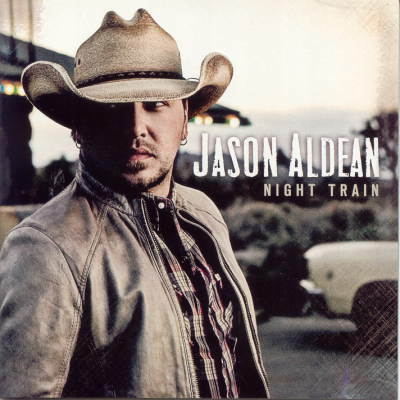 Country artist Jason Aldean marks his debut this week, with his fifth album of his career, Night Train, released in 2012. I have to admit, today's 21st Century Country, is not Country... It's Pop music, labeled as "Country." However, Jason Aldean is one of the few Country artists, you can actually label as "Country." Having said this, Night Train is really a combination of Rock and Country. Yes, it easily fits the more recent Country music (and proud to actually mention that). Yet, some songs here can fit today's Rock formats as well, even Southern Rock. Only one track reached #1 on Billboard's Country songs chart - "Take A Little Ride." And after listening to the entire Night Train album, this is a really good Country ride. The album starts out with "This Nothin' Town" -- a good, updated Country-sounding tune. There are many tracks here that are very good, fitting today's updated Country. Those to mention are: "Feel That Again," "Night Train" (title track). Then there's the "nice, slowed-down" Country tunes: "Talk," "I Don't Do Lonely Well," and "Staring In The Sun" (which reminds me of Tim McGraw). The album's closing song is also a nice and slowed-down number, "Water Tower." Aldean's #1 "Take A Little Ride" is DEFINITELY COUNTRY. Luke Bryan and Eric Church also appear on another "DEFINITELY COUNTRY" track - "The Only Way I Know." The latter tune reminds me of an upbeat Country song that Toby Keith would record. Night Train keeps getting better and better... The title track is a good Country tune, likewise the Toby Keith'ish "1994." "Drink One For Me" (oh yeah, with a song title like that one, it's got to be Country...) This one is also a Tim McGraw'ish sounding tune. Speaking of McGraw, there's "Walking Away." "Black Tears" is more mellow and darker, and fits more as a Southern Rock ballad. Jason Aldean IS Country... This is what today's Country should sound like. It matches the formats of Rock, Southern Rock, and of course, Country. For the true Country fans, you can't go wrong. Only one #1 from this album, yet there should have been more. Jason Aldean has had his shares of #1s, both with Country songs (9) and Country albums (5). He's even crossed over to the Billbard Album chart with three #1 albums. Country is Jason Aldean. If there were more country-styled artists like him, Country would return to what it should sound like. Country music. Good Rock music. Southern Rock music. Not Pop. Not Pop Rock. Not even Southern Rock Pop, if it does exist. Night Train is an ultimate Country ride. And a great ride it is, for repeated "travels." © WSVNRadio.net. All rights reserved. Review or any portion may not be reproduced without written permission. Cover art is the intellectual property of Broken Bow Records and is used for reference purposes only.